SKY MAP: The scene at 10 p.m. on July 7 from mid-northern latitudes. 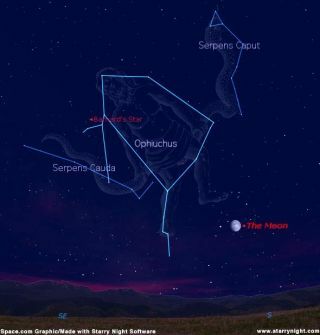 During the evening hours during this week, as the bright Moon moves away to the east, we can look high toward the southern part of the sky and trace out the "celestial medicine man" Ophiuchus, the Serpent Bearer, a star pattern that is teamed with the constellation Serpens. King James I of England, who reigned in the 1600s, once referred to Ophiuchus as "a mediciner after made a god," because the Serpent Bearer was often identified with Aesculapius, who in Greek Mythology, was originally a mortal physician who never lost a patient by death. This alarmed Hades, god of the dead, who prevailed on his brother, Zeus, to liquidate Aesculapius. In recognition of his merits, however, Aesculapius was put up into the sky as a constellation. An oddity about Ophiuchus is that the ecliptic-the apparent path of the Sun, Moon and planets-actually cuts through this constellation. In fact, the Sun spends more time traversing through Ophiuchus than Scorpius! It officially resides in Scorpius for less than a week: from November 23 through 29. It then moves into Ophiuchus on November 30 and remains within its boundaries for more than two weeks-until Dec. 17. Yet the Serpent Holder is not considered a member of the Zodiac and so must defer to Scorpius! Perhaps the reason was that in order to include Ophiuchus, there would have been an unlucky thirteen "Houses of the Sun" instead of the currently accepted twelve. Serpens the Snake is the only constellation cut in two. The Serpent's head lies west of Ophiuchus and is known as Serpens Caput; while to the east of Ophiuchus lies smaller Serpens Cauda, the tail. Four stars mark the head of Serpens. The three brightest-Beta, Gamma and Kappa Serpentis-are set in a nearly equilateral triangle. Off to the south of the Serpent's head is Messier 5, one of the finest globular clusters. Believed to contain over a half million stars, M5 can just be seen without optical aid as a fuzzy "star" on a dark, clear night. Small binoculars show a tiny fuzz ball, while giant binoculars show the cluster rapidly brightening toward the center with a slight hint of a mottled texture. The late Walter Scott Houston, who for many years edited the Deep Sky Wonders column for Sky & Telescope magazine once wrote of M5: "It is one of the better globular star clusters for small telescopes, because it actually gives the impression of being a cluster rather than an amorphous glow." In 1916, Edward Emerson Barnard (1857-1923) discovered a star in Ophiuchus that appeared to move against the general star background at a far more rapid pace across our line of sight than most of the other stars. Now called Barnard's "Runaway Star," a 9.5 magnitude (binoculars are necessary) red dwarf star. It is traveling toward the north at 10.3 arc seconds per year, the record for proper motion, which is the apparent motion of a star against the background of fixed stars. It's only six light years from Earth, and ranks as the second-nearest star to the solar system. Its actual velocity through space is about 103 miles per second. The association with a serpent may have come from the belief that, by shedding its own skin, it is rejuvenated. And to this day, the symbol of the medical profession is the caduceus, which is a winged staff with serpents twined around it.